Is there a better place to watch the rebirth of spring than the desert? A little winter moisture, a little increase of sunlight, and green shoots show forth as if by magic from apparently barren stone and gravel. Piles of sticks that seem only long-withered skeletons of plants will turn green and put out slender leaves. Dead-looking landscapes reveal how much life they hold concealed as seeds sprout and plants shake off their dormancy. Pollinators soon arrive, buzzing through the hills and washes. From February through June in a good year, a rising tide of life will flow uphill from the sea-level badlands, over the mountain flanks and canyons and up to the sparse forests and alpine tundra of the highest ranges. The desert is a place for patience, though. Not every year is a good one, and just like the plants and animals, humans eager to see this ecosystem’s richness must bide their time, sometimes for years. 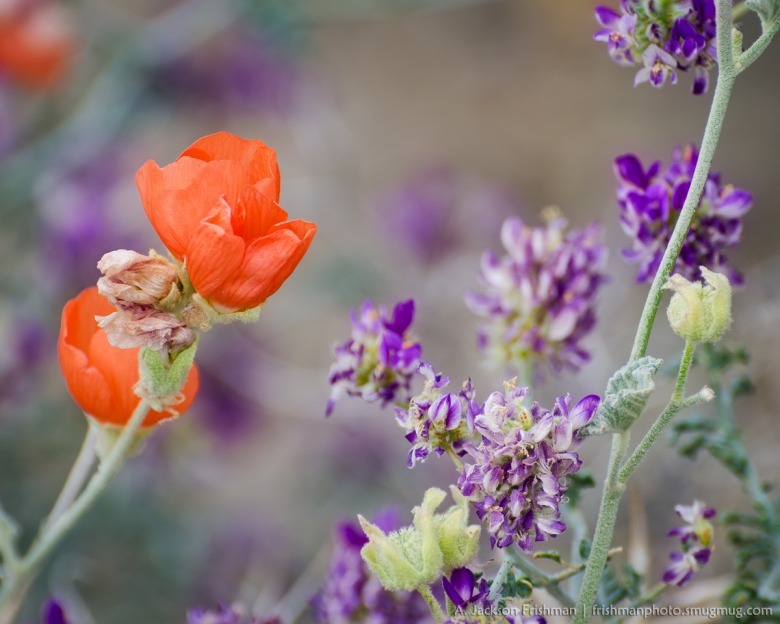 The Mojave desert and southern Great Basin, which united Mojave National Park, have recently had a run of very good flower years, and many people now seem to believe that so-called superblooms are an annual event. Park employees and naturalists have been sadly breaking the news that 2018 will almost certainly disappoint. Winter storms were very stingy in California and Nevada, and most flora are practicing their patience and waiting for better times. For us lucky residents and undeterred desert lovers, however, even a bad year has its charms. We won’t be seeing last year’s fields of gold or carpets of lupines and poppies, but isolated blooms always make an appearance here and there. Primroses and globemallow are fairly reliable in sandy soils and washes, and even a small patch of yellowthroats brightens a hike. Perennials like indigo bush, brittlebush, cactus or prince’s plumes are always a pleasure. 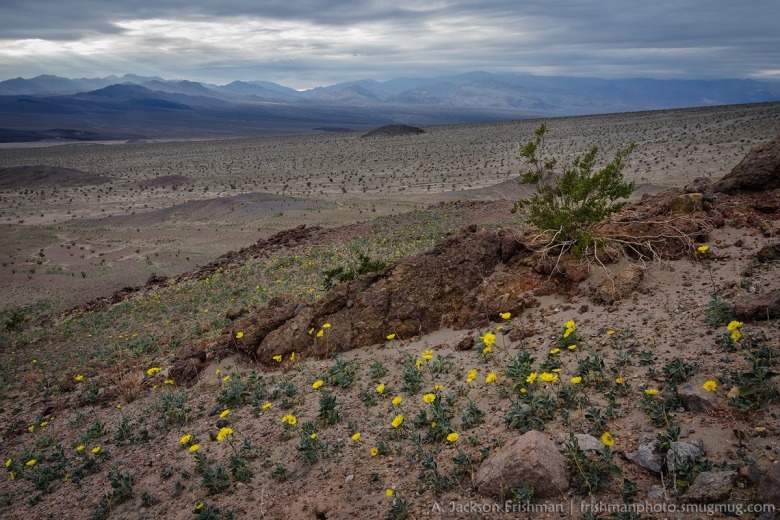 The iconic but underrated creosotes will turn yellow and come alive with insects, and Joshua trees, indicator species of the Mojave, put forth their surreal waxy blossoms. The major desert blooms of the last few years were also notable as the first such events to be saturated with social media coverage. These sights were once the domain of well-informed or lucky desert rats, but such days of obscurity are gone. Death Valley saw massive visitation in recent flower seasons, and many normally deserted locations filled with lines of cars, lines of hikers, lines of aspiring photographers and hopeful Instagram stars. This wasn’t all bad. 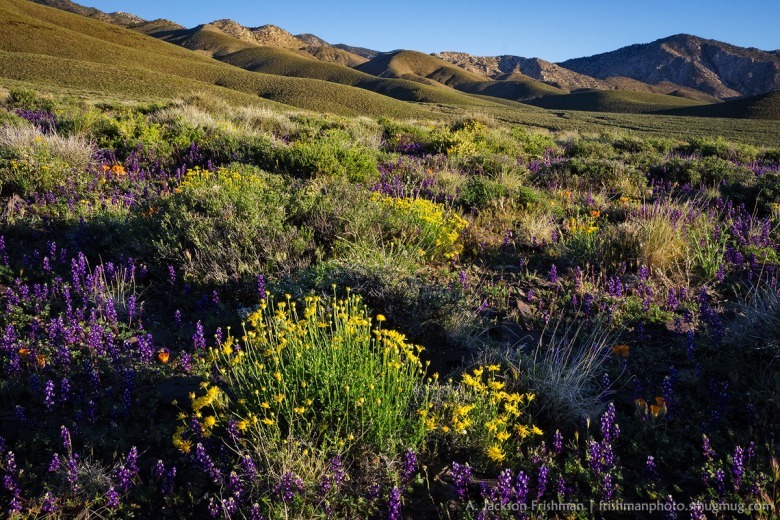 California’s Carrizo Plain National Monument, a landscape most people find underwhelming outside of flower season, received a well-deserved boost of publicity just as it came under “review” by Interior Secretary Ryan Zinke (so far it has not been targeted for changes). 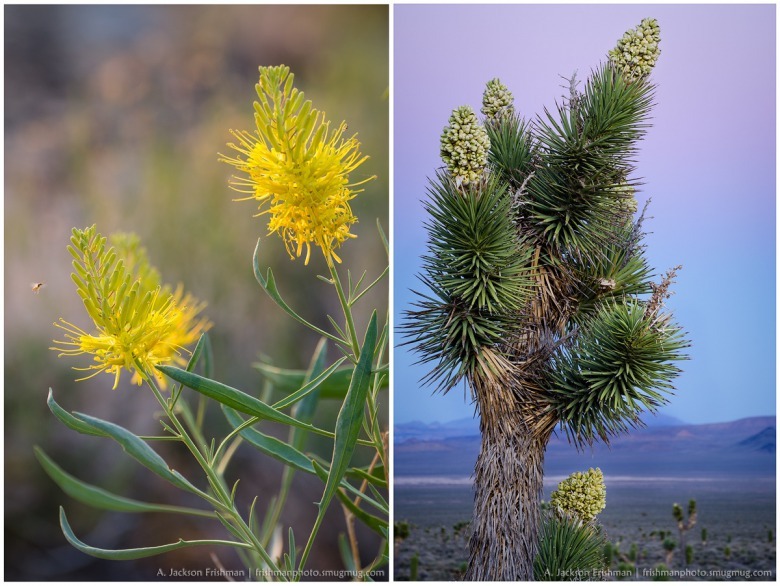 These blooms and their associated publicity gave a glimpse of desert beauty to more people than have ever before appreciated such ecosystems, at a time when these lands have great need of advocates. But the overcrowding, trampling and disregard were certainly real as well. Such special and ephemeral conditions are particularly vulnerable to social media hype, and many outdoor enthusiasts, particularly photographers like myself, are considering more than ever how to square Leave No Trace principles with a world where even taking pictures causes impacts and leaving footprints may be too much. My own home valley lies in mile-high desert, deep in the rain shadow of California’s highest peaks. I doubt anyone will ever think of it as a wildflower destination. Most tourists who pass by in summer on their way from Vegas to Yosemite probably wouldn’t believe it ever contains a flower at all. But in every spring I’ve seen here, the flowers have proved unpredictable but wonderful and even the dry years reveal an array of flora I never expected. Last year’s epic precipitation brought out an amazing set of species I’d never seen here before, with carpets of dwarf lupine liberally sprinkled with glowing orange mariposa lilies. This year will surely be very different, probably much subtler. The desert always keeps me guessing and always brings surprises. Even in the wake of a frighteningly dry winter, I’m excited to see what’s hiding in the soil, waiting for the spring. 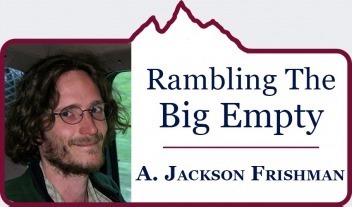 Read Mountain Journal's interview with Jackson Frishman The Big Empty Is Anything But. Jackson Frishman is a photographer who makes his home in the Deep Springs Valley along the Nevada-California border. He spent his early years in Jackson Hole and Bozeman and lived for a while in New Mexico. He savors capital W Wilderness and other country that is just as wild. 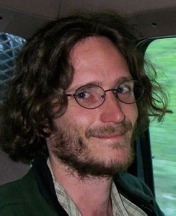 He and his wife, Niki, are parents of a young son.